Multi-million pound schemes to strengthen the road at two of the Island’s most unstable stretches of highway are due to start next month (November). The projects at Bouldnor Road in Yarmouth and the Undercliff at Niton are the first of 18 geotechnical schemes to maintain the road network being undertaken by Island Roads as part of the Highways PFI. At Bouldnor Road – the main approach into Yarmouth – the work will involve strengthening a 700-metre stretch of the highway between the Viewpoint Car Park and Yarmouth Green. 650 steel sheet piles will be driven up to 16 metres into the ground, a process called ‘soil nailing’ will also be used to stabilise the highway at the Yarmouth end of the scheme. At the Undercliff, where the underlying clay foundations have caused frequent and historic issues of movement, geotechnical work will be undertaken at three stretches. In the vicinity of Undercliff Caravan Park and a property called Woodlands, the highway will be anchored by 25-metre steel cables driven through the clay strata into a more substantial layer of rock. Both schemes – which will also see the treated stretches resurfaced and re-profiled to improve their cambers – are expected to take six months to complete and have been programmed to avoid the main holiday season where possible. The schemes have been designed in consultation with various bodies including Natural England and Natural Enterprise to minimise the impact on the environmentally sensitive areas bordering the highways. In the case of Bouldnor Road, Island Roads will also undertake a scheme with Natural England to manage the trees and shrubs around the Viewpoint Car Park. Another feature of the Bouldnor Road scheme is the use of specialist equipment for the piling operation. A quieter method of installing the piles will be used, which also prevents the requirement for a road closure for the entire duration of the scheme. 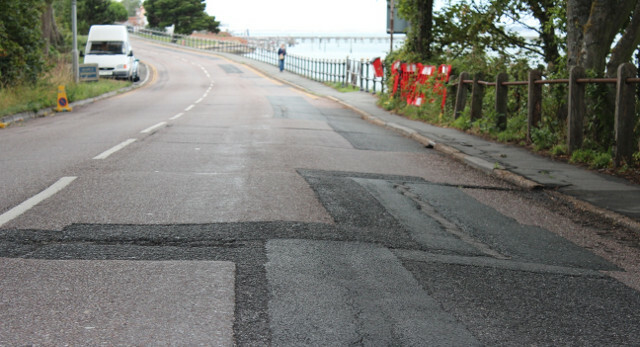 Affected residents and businesses in Bouldnor Road and the Undercliff will receive letters explaining the scheme in more detail as part of a range of measures to inform the local communities and travel companies about the work. “We know that the unstable nature of the highway at both of these locations has been a concern for many years. These schemes have been designed to finally bring lasting solutions to what are important parts of the Island’s highways network. “I am sure this major investment in stabilising these important parts of our highway network will be welcomed by residents and visitors alike. 14 Comments on "Island Roads to start work on two major road strengthening schemes"
Who in the Isle of Wight Council is actually validating and agreeing the specifications for the proposed works and who will be physically ensuring that the work undertaken complies with that which is agreed? No-one, Island Roads took over engineering and “Clerk of the Works” so now they scrutinise themselves. This was the arrangement made by the previous Tory administration and pushed through by Stuart Love after. Ask Shirley Smart and co. what they are going to do about it. Bystander please explain your implication for the uninitiated such as myself. Interests can compromise a Councilor not just directly but indirectly in that they leave them open to potential pressure from officers to comply with their wishes. Not true Mat. IW Council has a PFI contract manager who is responsible. But hey, misinformation is readily spouted it seems. Mark Griffin heads up the team overseeing the work on behalf of IWC and there is an independent ‘Clerk of the Works’. Where may council tax payers access an Organisation Chart of officers such as Mark (sic)Griffin and understand their roles and responsibilities in an open and transparent way? Do they intend repainting the white lines prior to work commencing? I wonder how the white lining of the entire island as trumpeted recently is coming along. Does anyone know? Are we waiting for the snow to fall first? The only new white lines that I have seen are on the Newport / Cowes road. Unfortunately, the previous damage done to the surface by Kielty Bros. has not been rectified. So we are still stuck with melting tarmac and loads of potholes at the Stag, but at least the lines are a gleaming white! Thank goodness we are going into winter. greenfiremouse,they put new white lines down through Carisbrooke high street,and promtly covered them up with fresh tarmac. Good question, who does supervise them? They seem to work in a totally random, ad-hoc way. The disruption, although understandable and acceptable if managed the work properly, does seem chaotic? Undercliff Drive has been and will remain inaccessible for coaches. Hardly a main road on a busy day? We have been subjected to road closures throughout the whole tourist season on Ocean View Road for the temporary fix. Which Island are the newly formed Island Roads from?